I took these slightly wobbly photos in February, I can’t even blame being drunk since it was a work night but hey at least you get to see one of my favourite outfits this winter. I was lucky that we had a very mild winter here in Toronto because it meant I did not have to pull out the down jacket more than twice. And while not looking like a burnt marshmallow is reason enough to love the warm winter, it more importantly allowed me to wear these beautiful tapestry boots. A lot. I LOVE these boots and picked them up on sale for about half off. I am almost afraid of wearing them too much less they start to wear…almost…but not quite afraid. 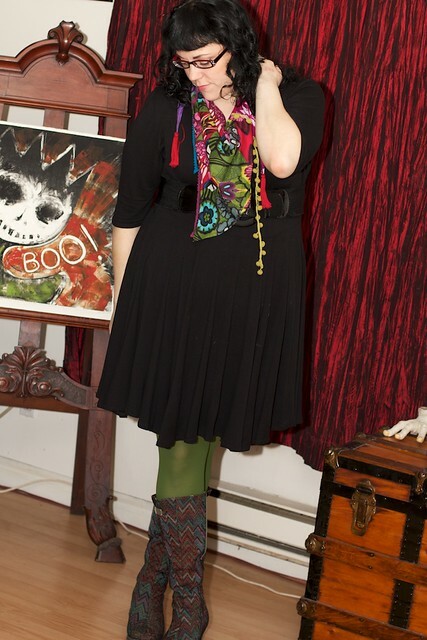 In fact I managed to wear a few outfits that featured them. I won’t lie, these babies get a lot of love, even my boss likes them. 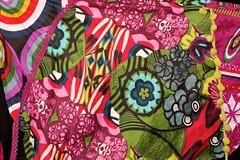 I also really love how the boots complimented the colours of this desigual scarf. I picked up the scarf during my December NYC shopping trip with two of my favourite ladies and out of all my purchases it gets the most wear. 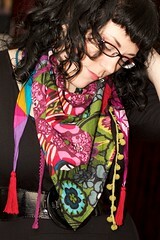 I could not wear any of the Desigual clothing, but I really like this scarf and the purse I bought. I can see why they have such a loyal following. Those boots! So awesome. I love how you’ve paired them with a complementary pattern. And i LOVE the picture behind you. 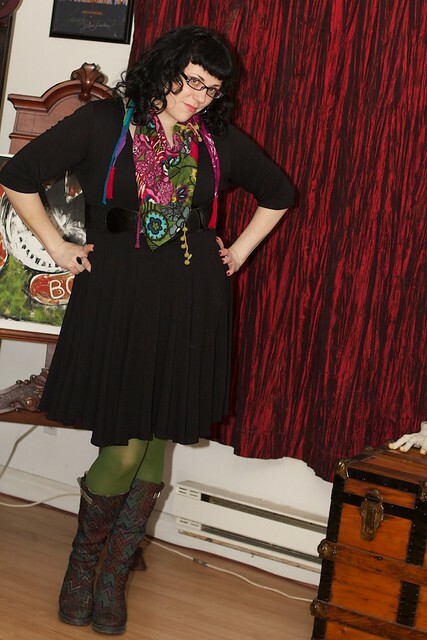 I just love the bright colors with the black! That scarf is so pretty! And those boots are amazing. Thanks Veronica! It is definitely one of my favourite go to outfits.